While many authors have proposed a firm’s human resources as an asset that can provide value and competitive advantage, the SHRM field has tended to ignore the fact that assets have associated uncertainties and risks. The real options view provides a theoretical framework for how firms manage uncertainties associated with investments in real assets. We apply this logic to analyze the uncertainties associated with human assets and discuss how firms manage these uncertainties through HR ‘options’ which are capabilities generated by some HR practices and their combinations. We discuss these practices and develop an options model for managing different types of uncertainties. Bhattacharya, M. & Wright, P. M. (2004). 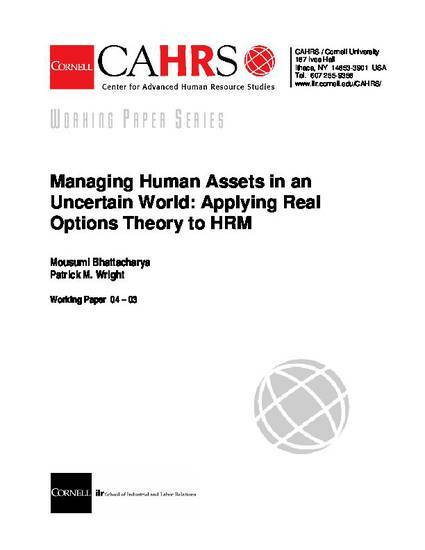 Managing human assets in an uncertain world: Applying real options theory to HRM (CAHRS Working Paper #04-03). Ithaca, NY: Cornell University, School of Industrial and Labor Relations, Center for Advanced Human Resource Studies.